Which way would most people direct any gentleman requiring a carnival? To Rome, of course, or to Nice, or, maybe, Mentone - perhaps by pre­ference to Rome, because the proverb assures us that all roads lead that way, and the gentleman wouldn't get lost. But the New World can supply a carnival as well as the Old - can supply carnivals, in fact, in good number. Perhaps the best known of these is that of New Orleans, taking place at the orthodox time - just before Lent. In future let Fargo, of North Dakota, rear its head as proudly as New Orleans. anybody is justified in solacing his flesh, it is the man who has had it scorched in the fire of 1893. But as a fact, the fire did Fargo ultimate good. It swept away, a prairie town of shanties and cabins, and now Fargo is a decorous, prosperous town of the brickiest and stoniest. So the anniversary of the fire is celebrated in Fargo with much rejoicing. 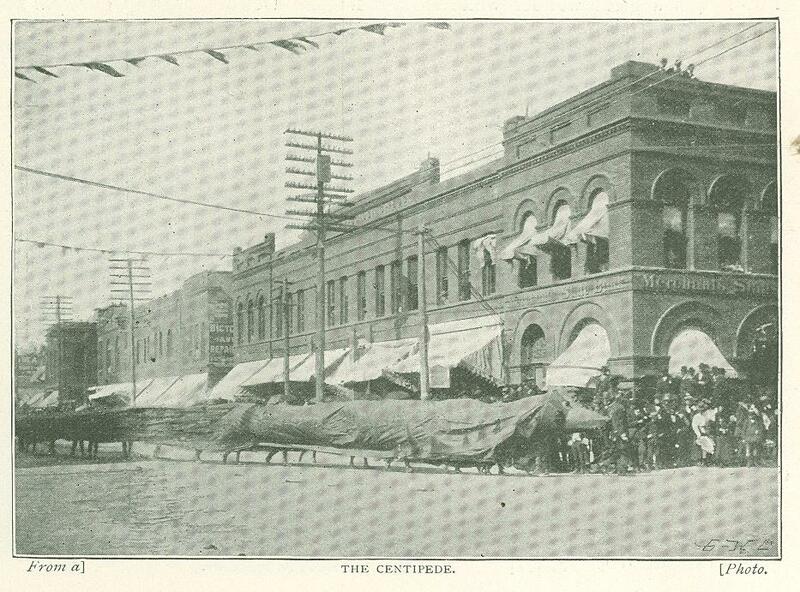 The secret society is an institution that flourishes exceedingly in Fargo, and it was at the suggestion of the "El Zagal Temple of the Mystic Shrine" (very noble, that), a branch of the Freemason's order, that the carnival took its beginnings, in the year 1894. In the four anniversary festivals since that date great pro­gress has been made, so that now great preparations are made, and vast quantities of brain power and mid­night electricity are squandered on the devices intended for display in the procession. Money is spent also, and this year' the procession alone cost $4,000, of which the El Zagal Templars expended half. 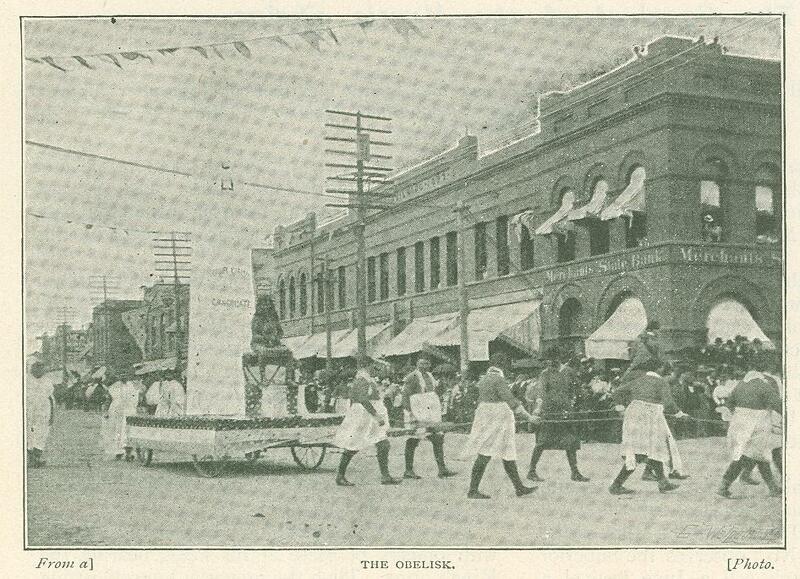 We give a few photographs of parts of this procession. First, in the morning there was, of course, a baseball match. Then, in the afternoon, the Fire Department gave an exhibition run, to an imaginary fire. At 2.14 p.m., the exact time at which the fire alarm was given in earnest on the day when Fargo was destroyed, an alarm in sham was given. Out came the engines, and, amid great excitement, they tore off to the terrible scene of destruction, gallantly. put out nothing, and returned amid enthusiastic plaudits. Then the procession started. First came the herald of Rameses the Great, with officers of State at his heels, bearing the King's arms. Then the monarch himself, sitting on a gorgeous throne, borne on the shoulders of many slaves. His majesty was a very popular character, and was received with vast enthusiasm, remarkable in a democratic country. His perspiring slaves toiled sturdily under the hot sun, and the chocolate stain on their faces ran gay in stars and stripes. After his majesty came a mighty retinue, and the bearers of the treasury on foot. 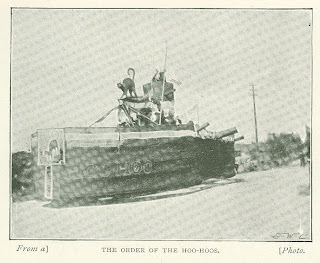 As will be seen in the photo­graph, these latter carry a mighty strong box on their shoulders, hasped and clasped and massive, suggestive of bullion and diamonds in pecks and bushels. 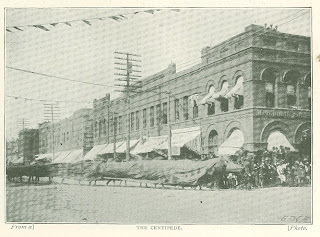 No attempt seems to have been made by the crowd to capture this chest en route, which is a great testimony to the honesty of Fargo; for, indeed, it was as valuable a soap box as the town could produce, embel­lished with most excellent paint; and it had been found most convenient to carry it empty. It is not stated what penalty was decreed for any sightseer so dar­ing as to look at the heels of the treasury bearers, and there to per­ceive the ends of their ancient Egyptian tweed trousers. Then there were more priests, and after them Apis, the sacred bull, with a neat em­blematical cloth across his back. Behind him carne the masters of the horse, gaudily bedight, and the horses themselves brilliantly caparisoned, and kick­ing up nobly be­fore and behind; and then such a crowd of "speci­mens -warious," as would have bemuddled the wits of Mr. Venus; the keeper of the records, more banner bearers, slaves with rolls of papyrus, over­seers of public buildings with instruments of office, and others. Next carne an obelisk curiously inscribed, drawn by sixteen "slaves," got up, as the photograph shows (although it doesn't show all of them), in a sort of rational dress with white skirts, and presided over by a hairy, choco­late-hued despot, with a long whip. On one side of the obelisk (not visible in the picture) there appeared the inscription: "Great King Rameses greets the nobles of the desert, and hangs out the rope of welcome to the novices - Es Selamux Aleikune." Which nobody can deny. There was also added the remark: "The sands are hot," which was very likely indeed. After the obelisk came a sort of panorama, meant to illustrate an Egyptian harvest scene. Laborers brandished ancient implements, and bullocks drew an Egyptian plough fashioned of a forked log, while behind walked the sowers with their bags of seeds about their necks - all correct "of course, though perhaps, rather liable to be mistaken for the hares starting out on a paper chase. Then, came a string of mules, with sacks of grain - just visible in the photograph, be­hind the sowers. 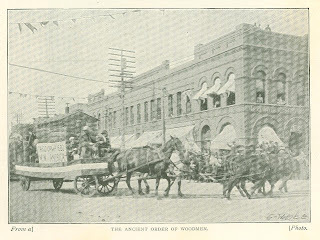 And the agricultural department finished up with an Egyptian thrashing ma­chine drawn by oxen. Next a big wagon carried a tableau representing the embalming of the dead. In the photograph one gets capital views of the grave and reverend signiors presiding over the operation, but the corpse is to some extent hidden by mystic draperies. It is satis­factory to know, however, that he took readily to the embalming fluid, and (the day being hot) was even understood to ask for more; also that the process was so entirely successful that he is in excellent health now, and very active. A terrible warning to politicians was hung from the tail of the wagon. After the embalming of the dead naturally followed the judgment, accord­ing to ancient Egyptian ideas, and a tableau of the allegory of the passing of the soul of Menes over the sacred lake in care of Charon. And then - the feature of the procession. This was a sinuous, low, many-legged monster, 140ft. long, illustrating the trans­figuration of unaccepted souls. It would seem that the unaccepted soul of the naughty ancient Egyptian was apt to be transmigrated into the body of a gigantic centipede or cater­pillar - unless the thing is a dach­shund. A long file of small boys provided the legs and the locomotion, and great enthusiasm greeted the some­what wobbly progress of the brute. But disaster awaited this procession within a procession. The burden of the unaccepted souls grew very heavy, and the close heat under the covering, warmed by the blazing sun, grew more than the boys (unpoetic rascals!) would stand, and so the weird monster drooped and died by the wayside, became transfigured into a rebellious and thirsty mob of parboiled school­boys, and the procession knew it no more. But it was a great wonder while it lasted. 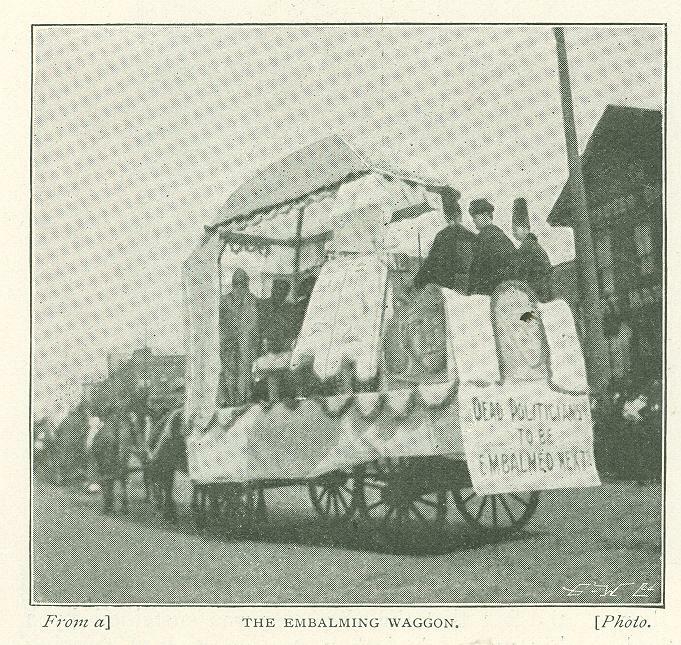 No Egyptian procession would be complete with­out Cleopatra, and there she was, barge and all, being drawn, as an improve­ment on classic traditions, by mules. And a very handsome Cleopatra he was, too, and she bore himself right royally, with her majestic head on his broad shoul­ders towering above those of her attendants in his barge­ - mixture of genders due to the fact that the character was sustained by a big man. And then came a rush of dancing dervishes, and all was gas and gaiters. But there was no bigoted adherence to things Egyptian in this procession. 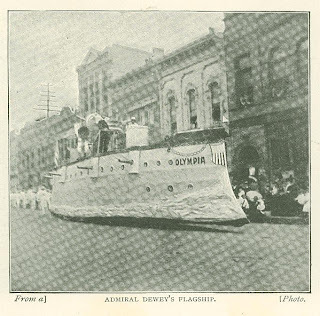 Topical matters had their share, and Admiral Dewey's flagship Olympia came steaming down the street, as the next photograph shows, banging off terrific can­nonades at the shop windows. It did actually steam down the street, being neither drawn nor pushed, but carried by a traction engine in its interior. Perhaps to repre­sent the trail of foam beaten up by her propeller, a detachment of sailors in white uniforms followed, every man bearing the national flag. Boys, moreover, were not done with the procession yet. They might be beaten at a centipede or a dachshund, but they could play at soldiers all the time. And so they marched, a full company of them, with guns at the slope - terrible guns, made of the most mur­derous broomsticks in all North Dakota, with flat stocks nailed on. A long lorry carried a representation of the log cabin that was familiar in the district ages ago, in 1893. The washing was realistically hung out, and round behind the neighbors fiddled merrily the old dance tune of "Hoe Down." 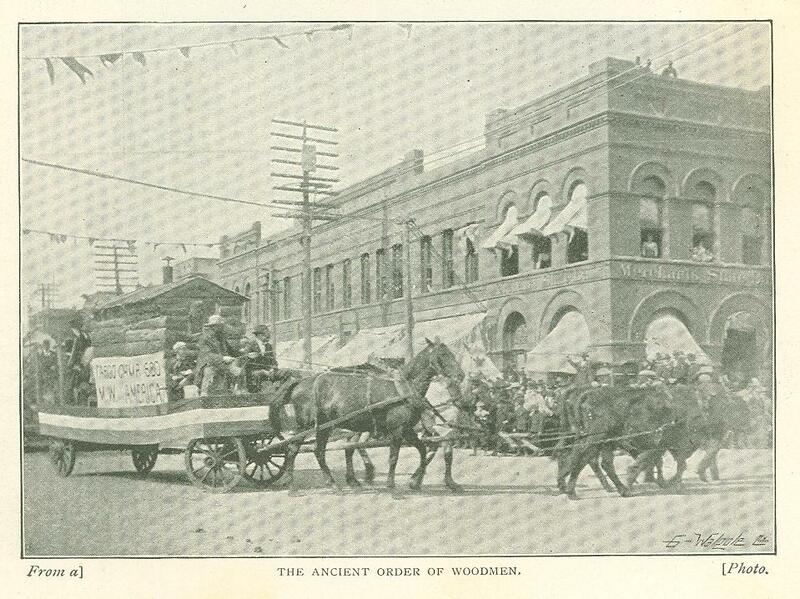 This tableau (or "float," as it is called in America) was the contribution of the Ancient Order of Woodmen. 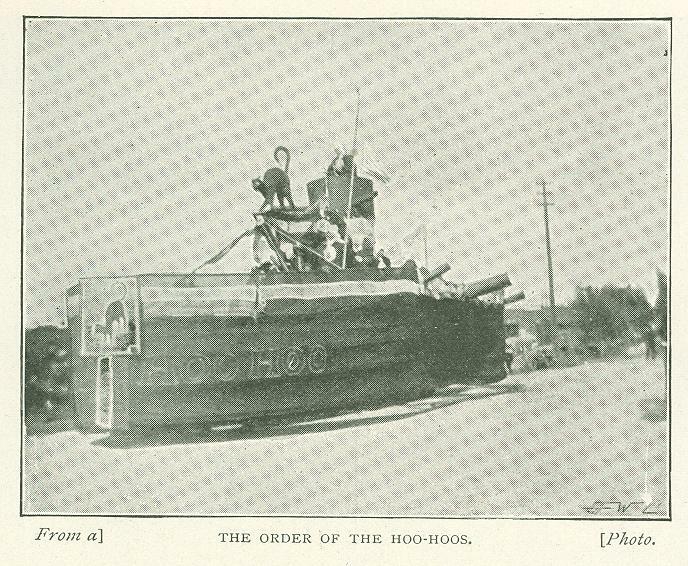 Another secret society - a weird and terrible organ­ization spoken of (with bated breath) as the "Order of the Hoo-Hoos," came out with their own ship of war, with deadly stove pipe guns complete. The terror inspiring en­sign of the order - the direful Black Cat - was conspicuously dis­played, and a vigilant look out was kept from the tower by an eagle­ eyed member armed with a pair of binoculars, made especially large, by the simple process of lashing together two empty beer bottles. It is freely rumored that upon news reaching Madrid of the completion of this formidable war vessel, the Spanish Government instantly made over­tures for peace. Another topical feature, and not the least of them, nor the last, was furnished by the inspiring spectacle of Uncle Sam and John Bull march­ing side by side. Certainly they are rather a long way apart in the photo­graph, but the appearance is largely due to the short focus of the camera, and, anyway, the intention is good enough. It may be taken to typify the march­ing side by side of John Bull and Uncle Sam, each on his own side of the way, and not crowding the other; also that Uncle Sam and John Bull take up all the street between them. 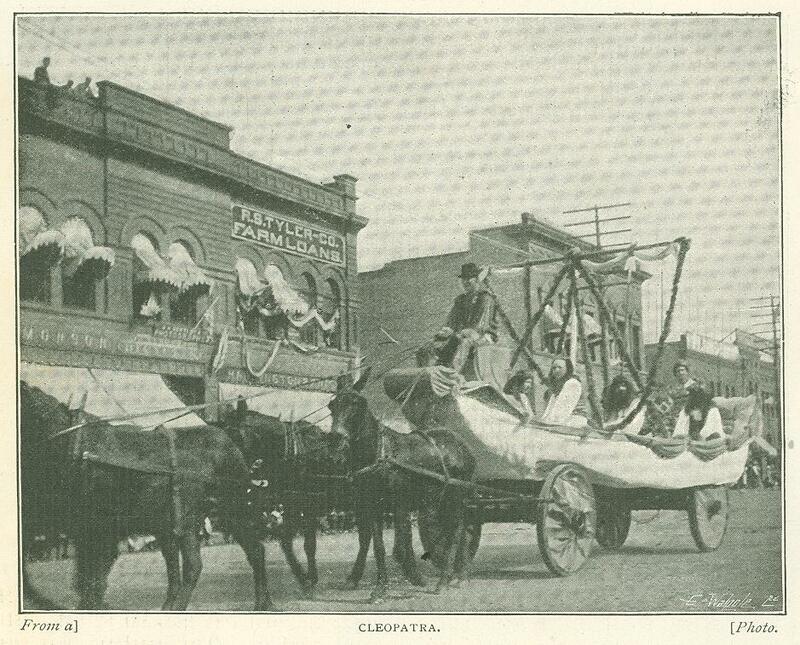 And so went the June carnival of 1898 at Fargo, North Dakota - no bad bit of fun in its size for a town of no more than 10,000 inhabit­ants. And in the evening there was great business at the lodges of the societies, for it was the great occasion for ini­tiation of new members.